I’ve reached the age where I have to use reading glasses and so does just about everyone I know. I have to get mine from an optician because one eye needs a much stronger lens than the other, but most people buy a few pairs of the cheap-as-chips specs that are on sale in every High Street and keep one in every room in the house. I was having coffee with a pal, Fiona, who is in this presbyopic demographic too. 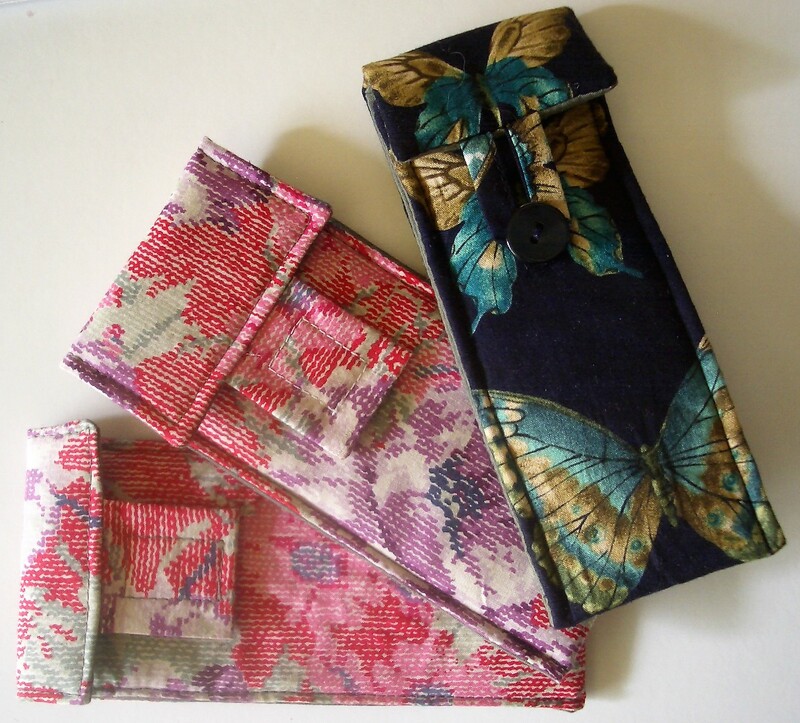 When I pulled a little zipped pouch out of my handbag while searching for a pen, she admired the butterfly fabric and said she needed something similar for her reading glasses. That surprised me, as the cotton fabric and light padding don’t offer a lot of protection, but Fiona pointed out that her cheap reading glasses were much smaller than most hard cases and she just wanted something lightweight that would stop the lenses from getting scratched in her handbag. As she said, there’s no point lugging around a bulky, heavy case to protect something that cost £2.50 and can easily be replaced if necessary. This got me thinking. I’m always looking for new ideas for Christmas stocking fillers and slim cases for reading glasses would fit the bill perfectly. 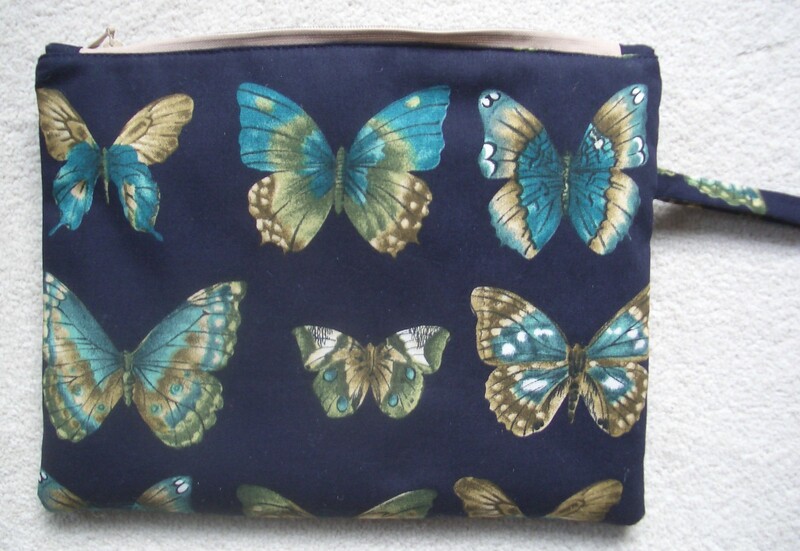 I started by making a case for Fiona from the butterfly fabric – not ideal as it turned out, because the spacing of the butterflies doesn’t fit well with the dimensions of the case, but I’m hoping Fiona will be happy with it. The second one I made has the butterflies running sideways, which works better. I then made a few more in different fabrics, some with button and loop fastenings and some with Velcro. A similar design works as a mobile phone case too. I made a few slightly wider ones which will do as little presents for the younger women in my life who don’t (yet) need reading glasses. All very easy and nothing required other than scraps of cotton dress fabric or lightweight furnishing fabric, polyester wadding and buttons or Velcro. This entry was posted in sewing and tagged eyeglass case, glasses case, spectacles case. Bookmark the permalink. Great cases! Perfect for all those small scraps. Yes, each one only takes a rectangle of fabric 38cm x 10-12cm and another in lining fabric.